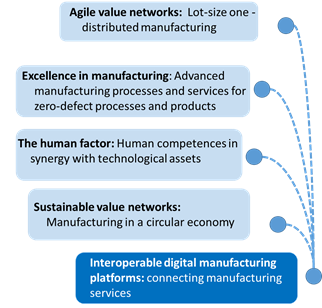 Digital manufacturing platforms according to EFFRA's Factories 4.0 and beyond document. Digital manufacturing platforms are enabling the provision of services that support manufacturing in a broad sense. The services that are enabled by digital manufacturing platforms are associated to collecting, storing, processing and delivering data. These data are either describing the manufactured products or are related to the manufacturing processes and assets that make manufacturing happen (material, machine, enterprises, value networks and – not to forget – factory workers. Additional note: digital platforms for manufacturing can provide any “digital” extension of functionalities to physical assets. In practice it is the way of seeing the CPS or Cyber-Physical Systems concept but in terms of functional platforms. Planning of manufacturing, predictive and automated maintenance, etc. These services are provided by multiple service providers for a multitude of users of these services (in a multi-sided eco-system). In general, digital platform for manufacturing can provide any “digital” extension of functionalities for physical assets, through adoption of ICT technologies. Digital platforms play a crucial role enabling the application sceanarios of digital manufacturing. All services are aimed at optimising manufacturing from different angles: production efficiency and uptime, quality, speed, flexibility, resource-efficiency, etc. The digital platforms are situated in-factory and ex-factory, i.e. the cloud. Pre-requisites for digital platforms to thrive in a manufacturing environment include the need for agreements on industrial communication interfaces and protocols, common data models and the semantic interoperability of data, and thus on a larger scale, platform inter-communication and inter-operability. As it is the case for any industry-relevant innovation, standards need to be considered, including work on reference frameworks or architecture models such as RAMI 4.0 (More about RAMI 4.0). The possibility to connect to additional services according to the ‘plug-and-play’ philosophy and considering the multi-sided ecosystem of service providers, platform providers and manufacturing companies. The modularity of existing or in-development platforms of covering different “regions” of the RAMI framework. The ConnectedFactories project is developing more insight in the deployment of digital manufacturing platforms in manufactiring. Digital manufacturing platforms, according to the Digitising European Industry initiative - Working Group 2. The Digitising European Industry initiative - Working Group 2: Strengthening Leadership in Digital Technologies and in Digital Industrial Platforms across Value Chains in all Sectors of the Economy' has issued its final report in August 2017. "Such (digital) platform integrates (data from) various functions implemented by different technologies via clearly specified interfaces, and makes data available for use by applications. For instance, a platform could make available product quality data from a factory floor provided by visual inspection machines and human operators, for use by monitoring applications that process quality data. Platforms are like operating systems that bring together different technologies, applications and services. They open up data from e.g. the machines, products and operators on a shop floor, make it accessible to e.g. monitoring and control applications, may provide open interfaces that allow third-parties to develop applications on top, and connect different stakeholders, such as users and application developers. In a community role, digital industrial platforms may have users explicitly connecting with each other, as in social networks. Some may have users exchanging items as in marketplaces. The community is where third-party producers create value and is a key source of value for the platform. To enable this value creation, the next role is needed. In an infrastructure role, digital industrial platforms provide infrastructure and functionality, and more importantly, may allow users and partners to build applications and create value on top of this infrastructure. This openness to and reliance on third-party complementary applications determine the value of digital industrial platforms: more developers working on the platform create more applications; more applications make the platform’s offering more valuable, and results into more customers using the platform; more customers using the platform attracts more developers. The infrastructure role also channels the data that the platforms unlock and integrates different technologies and systems. In a data role, every digital industrial platform makes data accessible and uses and processes data in some way. In many cases, the value may exclusively lie in the data that is made available from connected applications, sensors and devices. Different platforms fill in the above three roles in different ways and to varying degrees. Some focus more on connecting users and providers (e.g. Facebook), some on unlocking data (e.g. Nest), and others act as development platforms for third parties (e.g. Android). Many real-life examples show a combination of the three roles. Successful platforms offer an ecosystem where four types of players can be distinguished: the owners of platforms who control their intellectual property and governance; providers who serve as the platforms’ interface with users; producers who create their offerings; and consumers who use those offerings."